With astonishing range and depth, the essays, speeches, and opinion pieces assembled in this book chronicle a ten-year intellectual odyssey by Salman Rushdie. 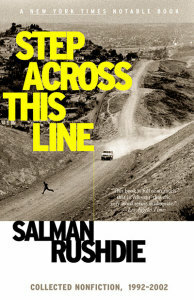 Step Across This Line concentrates in one volume Salman Rushdie’s fierce intelligence, uncanny social commentary, and irrepressible wit—about soccer, The Wizard of Oz, and writing, about fighting the Iranian fatwa and turning with the millennium, and about September 11, 2001. Ending with the eponymous, never-before-published speeches, this collection is, in Rushdie’s words, a “wake-up call” about the way we live, and think, now.